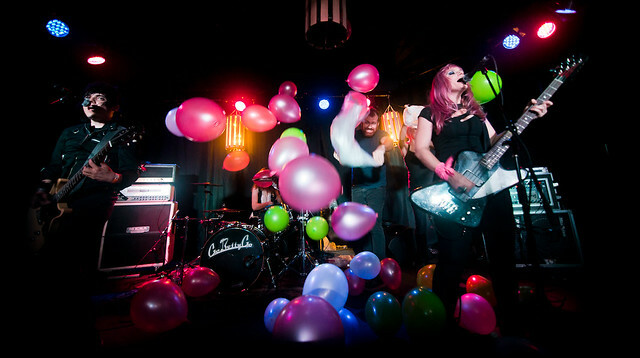 The Dollyrots had their record release party for Barefoot and Pregnant at The Satellite. Last Thursday at the Satellite was a cause for celebration on so many levels. 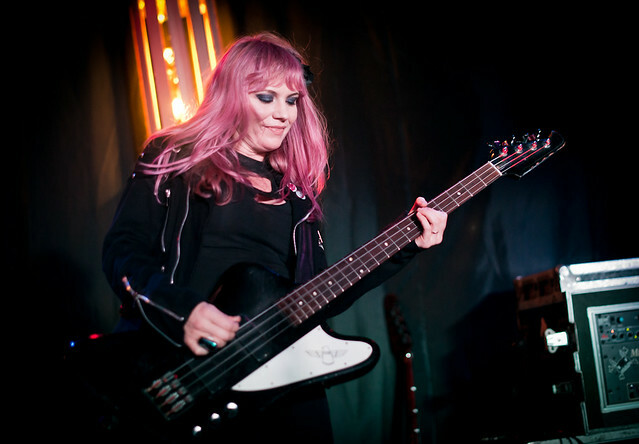 After a long hiatus, which saw The Dollyrots play their last show last July, Kelly Ogden and Luis Cabezas took the stage at The Satellite in Silver Lake to celebrate the release of their new album Barefoot and Pregnant which drops February 25th. But of course, the title of the album isn't a coincidence. You see, Kelly was pregnant during the recording of their fifth album and twelve weeks after giving birth, Kelly was back onstage, with a glow, and rockin' out like she's never missed a beat. On their new album, The Dollyrots went back exploring their roots and just as both Kelly and Luis welcomed a new life to the world, Barefoot and Pregnant represents a new beginning while also taking them back to their own beginnings as a band by writing simpler songs with catchy hooks and, above all, really good melodies; sort of like what was present on their 2004 debut album Eat My Heart Out. And you can tell being pregnant during the recording process rubbed off with on Kelly's writing with touching songs about the bonds of family and love in "Nightlight," "Bury Me In Ireland" and the title track "Barefoot and Pregnant." While in "Puppy Dog Eyes," although written for their dog Quito, some of the lyrics could've been born from Kelly's motherly instincts when she sings "You can do no wrong. Love's unconditional. I promise I won't bite. Let me melt you're heart with puppy dog eyes.. I'd take a bullet for because you're all I ever want to live for." Quick trivia: For "Puppy Dog Eyes," Kelly mentioned that the vocal track on the album was recorded while she was laid up pregnant in bed. They kept the track on the album after failed attempts to re-record it better. Of course, Barefoot and Pregnant wouldn't be a Dollyrots album without their signature breakneck speed, sugary, punk-rock anthems and they deliver with sure to be fan favorites like "First World Anarchist" and "Stupidly In Love." 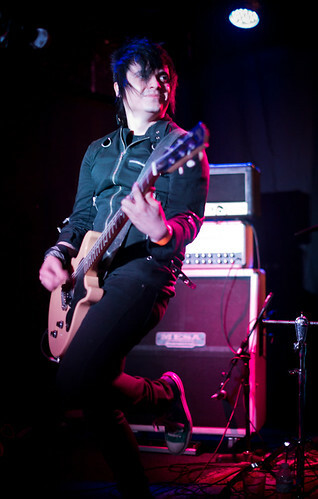 Kelly Ogden of The Dollyrots gave birth to son River in November. The Dollyrots are gearing up for an upcoming tour, going on the road for the first time as a family with new son River. You can catch them when they perform at this year's SXSW in Austin this March. And be sure to grab Barefoot and Pregnant right HERE. Setlist (Feb. 20, 2014) - Hyperactive / First World Anarchist / Brand New Key / Bury Me in Ireland / Satellite / Jackie Chan / Get Weird / Puppy Dog Eyes / Twist Me To the Left / Because I'm Awesome / My Best Friend's Hot.